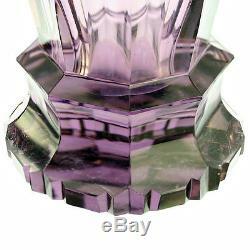 An important and striking lilac vase, with a wave edge rim above sculptural mouldings, relief rhomboid points and cut facets over a waisted and notched pedestal base. 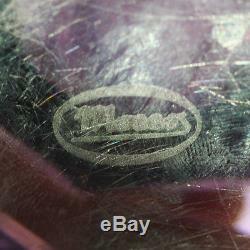 Condition: some internal marks to the lower section through the use of a metal flower arranger or similar; light surface age and use wear; one or two minute nicks to high points; nothing further found. Design circa 1935-38 by either Arnold Zadikow or Rudolf Eschler, acid mark to the base suggests a later production circa 1950s. Article measured in centimetres and rounded to the nearest quarter inch. 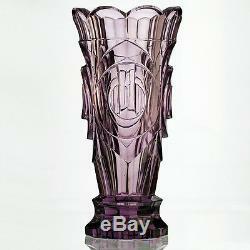 1950s Moser sculptural moulded & cut crystal lilac vase, Zadikow or Eschler" is in sale since Saturday, December 3, 2016. 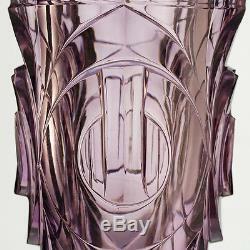 This item is in the category "Pottery, Porcelain & Glass\Glass\Date-Lined Glass\1950s/ 1960s/ 1970s". The seller is "fairdealer3" and is located in Devon. This item can be shipped worldwide.